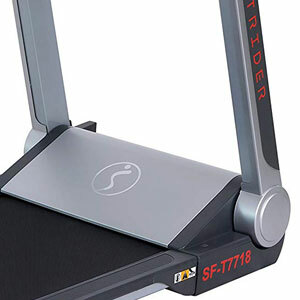 The SF-T7718 is one of the newest treadmills from Sunny Health & Fitness for 2018. It’s a light capacity machine, made for walking and jogging, but can provide speeds up to 9.0 MPH. One of its main pluses is that it can be folded flat, this way taking very little storage space. It’s an excellent machine for home use, and also an affordable one. 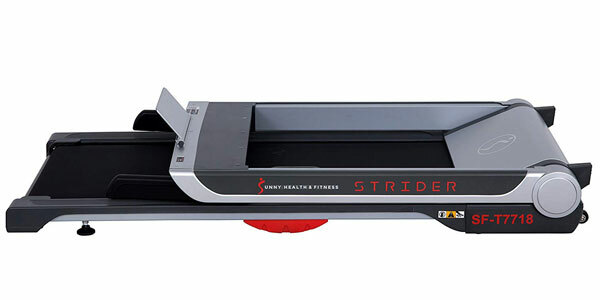 Similar to the Sunny ASUNA 7750 treadmill that we’ve previously reviewed here, the SF-T7718 features a space-saving design with a fold-flat frame, which offers the possibility to be stored in narrow spaces. The console mast with the side grips folds all the way down over the deck, resulting in an overall height for the folded unit of 7.25″ (18.5 cm). This being said, you can store it under your bed if there is a clearance over 7.5″ (19 cm). Its folded footprint remains approx. 62″L x 29.5″W (157.5 x 75 cm). However, the unit can also be stored vertically. Its front base features two small bars with transport wheels which not only that facilitate the unit’s relocation, they can also serve as vertical stabilizers for it. With the frame unfolded and in the usable position, the unit’s footprint measures approx. 63″L x 29.5″W (160 x 75 cm), while its highest point is approx. 48″ (122 cm), given by the top of the tablet holder. Needless to say, the Sunny Health & Fitness SF-T7718 treadmill features a steel frame. However, it has ABS covers for the console masts, motor, and for the side rails, for a more aesthetic aspect. 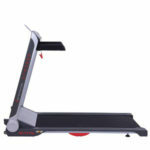 Although it can be labeled as a light capacity treadmill, the Sunny SF-T7718 isn’t exactly light-weight. Its net weight is approx. 117 lbs (53 kg), a weight that provides plenty of stability. Not only that, but its rear part features a set of adjustable levelers, while its front part rests on rubber pads. The machine’s deck is pretty durable for a light capacity treadmill. It’s rated for a maximum user weight capacity of 250 lbs (113 kg). It also integrates two shock absorption elements, one on each side, in order to provide a higher protection for your joints than a walk or a jog on an asphalt or concrete surface. 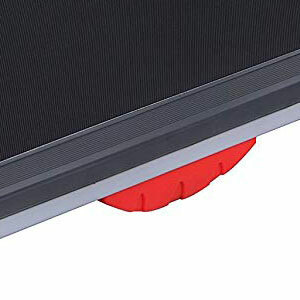 The belt offers a walking surface of 46″L x 20″W (117 x 51 cm). This is an optimal surface for walking and jogging. However, even though the unit can deliver speeds up to 9.0 MPH, taller users than 6’0″ (183 cm) may find it a bit short for running. This is one of the reasons we place this machine in the category of walking/jogging treadmills. Most running treadmills have a belt that’s at least 60″ (152 cm) long. This Sunny treadmill does not have an incline system. Also, its walking surface has a very low profile. Its step-up height is only approx. 3″ (8 cm). Therefore, you won’t have to worry about hitting the ceiling when using the machine. 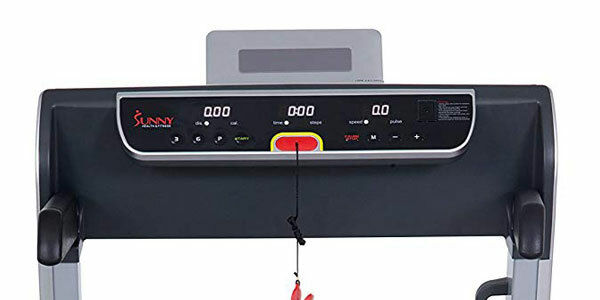 The Sunny Health & Fitness SF-T7718 is an electric treadmill. This means it requires to be connected to a power circuit. It integrates a motor similar to the SF-T7514 model, with a 2.5 HP Peak Power / 1.25 CHP which is more than enough for walking or jogging workouts. It’s also powerful enough to support any user up to 250 lbs (113 kg), for prolonged exercising routines, without overheating or losing performance. This motor delivers a speed range between 0.6 MPH and 9.0 MPH. The speed can be adjusted from the console only. There are +/- keys for gradual speed adjustment on the right side of the unit, and quick speed controls for the 3 MPH and 6 MPH on the left side. The unit’s speed increments are 0.1 MPH. This being said, it gives you the possibility to find the perfect pace for your height and workout intensity. Also, the speed of the belt adjusts gradually and smoothly, without sudden jerking, allowing you to adjust your stride and pace with ease. There are two more aspects to mention here. One regards the level of noise generated and power consumption. The machine’s integrated motor is far from being noisy, and during a walking workout, your cadence can barely be heard. Evidently, if running at full speed, your cadence will be heard, and the unit will become louder, but it’s not loud enough to cover the sound of your TV on a moderate volume setting. The second and last aspect regards the power consumption. The unit’s motor is not exactly a very powerful one, so you won’t have to worry about high electricity bills even if you use the machine daily. The console unit is actually a simplified version of the ASUNA SpaceFlex 7750. It features a LED display with three separate windows. The left window indicates distance and calories burned, the middle window shows time elapsed and step count, and the right window covers speed and pulse. For speed and distance, there are only English units available (MPH and miles). Also, the console is not telemetric. In other words, it cannot read your pulse via a Polar HR chest strap. However, it has a contact sensor on the right side, so by pressing your finger against it, you can still benefit from a heart rate reading. Goal settings are available for time, distance, and calories burned. When a goal value is selected for one of these metrics, the console will begin to countdown from that particular value until it reaches zero. Therefore, you can set up limits to break for each one of your workouts. In terms of programs, the console offers 9 preset ones, from P1 to P9. They’re interval-based programs, each one of them alternating different speed settings throughout its duration. Each program has 10 sections (or 10 intervals). You can select a total duration for each program, and each interval will last a 10th of that selected duration. The starting speed for each program is either 1.2 MPH or 1.8 MPH. Before the start of each interval, the console will beep in order to notify you about the speed change. The SF-T7718 console has an integrated Bluetooth connection. This being said, you can sync it with your phone or tablet in order to access the Sunny Health & Fitness app, for online tracking of your workout data. A USB port is also available. However, this only serves as a docking port for recharging your phone or tablet. Finally, the console unit features a sound system and a tablet holder. The sound system consists of two small speakers under the console. An MP3 cable included which you can use to connect your phone or tablet to the unit and play your music through the console speakers. The tablet holder is placed at the top of the console. It has a non-slip element to prevent your phone or tablet from falling. It’s also foldable, providing better storage possibilities for the whole machine. The Sunny Health & Fitness SF-T7718 treadmill comes fully assembled. All you need to do is unfold it, plug it in, attach the safety magnetic key and you should be ready to go. However, before the first use, it’s necessary to lubricate the belt with the included silicone lubricant. For maintenance, the walking belt should be kept clean. Any small objects, dust, sand, or textile fibers should be wiped off before each use to prevent any damage to the motor. Of course, the belt requires periodic lubrication. The console actually has a lubrication reminder which will prompt you to re-lubricate it after every 188 miles traveled. 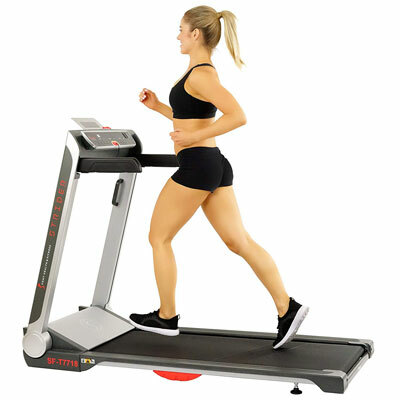 The Sunny Health & Fitness SF-T7718 is a walking/jogging treadmill featuring a fold-flat frame, a 2.5 HP motor, and a speed range of 0.6-9.0 MPH. Its console offers 9 preset programs, goal settings, and is compatible with the Sunny fitness app via Bluetooth. It’s an excellent treadmill for light to medium intensity cardio workouts, muscle toning, speed, walking, building stamina and losing weight. It’s also an affordable unit with a great price/quality ratio.